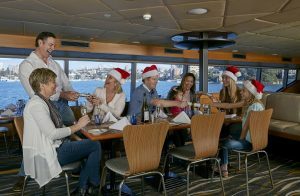 Spend Christmas Day relaxing on Sydney’s magnificent Harbour on a Captain Cook Cruises Christmas Day lunch cruise. With no meals to prepare and no washing up to be done, the whole family can enjoy a stress-free Christmas. 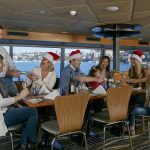 Held on-board the prestigious, MV Sydney 2000, with three separate dining decks and an open top deck offering 360-degree views of Sydney Harbour, choose from three Christmas Day lunch cruises. The Sky Deck Christmas lunch is the ultimate Christmas Day experience. Soak up the million-dollar views from the uppermost dining deck while enjoying a five-course premium menu and an open bar of superior spirits, premium wines, beers and soft drinks. The Club Deck lunch offers a fabulous festive Christmas buffet feast including Virginia baked leg ham, roast turkey, Marinated Beef Sirloin, Sydney rock oysters, king prawns, N.Z Mussels, Barramundi, smoked salmon, a wide selection of salads and vegetables, assorted petit cakes, plum pudding and mince pies. The Club Deck lunch also includes a superior selection of wines, beers and soft drinks. The Show Deck Christmas buffet lunch offers the same expansive feast as the Club Deck with a standard selection of wines, beers and soft drinks. The MV Sydney 2000 departs 12 noon on Christmas Day, Tuesday 25th December 2018 from No.1 King Street Wharf, returning at 3.00pm. The Sky Deck Christmas lunch is priced at $259 per adult and $199 per child (4 to 14 years). Guaranteed window seating is an additional $39 per person. The Club Deck Christmas buffet is priced at $249 per adult and $199 per child. The Show Deck Christmas Buffet is priced at $199 per adult and $155 per child. Guaranteed window seating for Club and Show deck lunches is an additional $25 per person.